The path to energy-efficient lighting takes another step forward with the introduction of the Wireless Occupancy Sensor from Lutron Electronics Co., Inc.
Providing a simple way to go green, the innovative sensor is specifically designed for easy installation in conference rooms, copy rooms, small offices, classrooms, living rooms, bedrooms, restrooms, and other spaces where automatic lighting shut-off is desirable. It installs in minutes. Simply place the sensor on the ceiling and replace your standard light switch with a compatible Lutron dimmer or switch – no wiring is required to the sensor. The sensor contains front-accessible buttons for easy setup and an illuminating lens to verify ideal locations. The sensor contains cutting-edge technology to detect fine motions and perform reliably. It has user-replaceable batteries, designed to last up to 10 years. For flexible and scalable energy-saving retrofits, up to 10 dimmers or switches can communicate with a sensor via radio frequency, and users can add up to 3 sensors for superior coverage. The sensor saves energy by turning lights off when a room is unoccupied. Each Lutron Wireless Occupancy Sensor can save up to $85.00 a year. * What’s more, using a compatible Lutron dimmer, with the sensor, allows you to automatically turn lights on to a dimmed level rather than to full-on, saving even more energy. 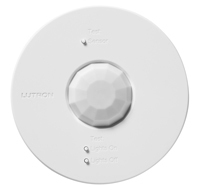 The Lutron Wireless Occupancy Sensor can be programmed to operate as an occupancy sensor (automatic-on and automatic-off functionality) or a vacancy sensor (manual-on and automatic-off functionality). A vacancy-only model is also available to meet the California Title 24 Energy Efficiency Standard requirements. The Wireless Occupancy Sensor is compatible with the Lutron Maestro Wireless® dimmer (as well as with Maestro Wireless® switch); the Vierti® Wireless dimmer or switch; and GRAFIK Eye® QS Wireless light and shade control. “We are very excited about this break-through product. Now homeowners, facility managers, and contactors can retrofit a space in minutes to save energy and money, without any rewiring,” says Eric Lind Director – Commercial Marketing for Lutron Electronics Co., Inc.
For more information about the new Lutron Wireless Occupancy Sensor, visit www.lutron.com/occsensors.